IS OIT EFFECTIVE? ISN’T IT A “NEW” TREATMENT? 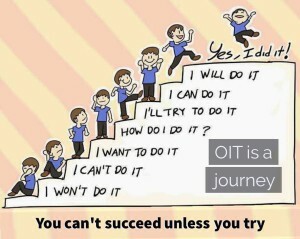 OIT: WHAT ARE THE END GOALS? WILL MY CHILD “QUALIFY” or BE A CANDIDATE FOR OIT? IS OIT THE RIGHT CHOICE FOR US? OIT stands for oral immunotherapy also known as desensitization therapy. Oral desensitization is a method of retraining the immune system to tolerate food proteins to which it is currently sensitized. It involves the regular administration of small amounts of allergen (food) by mouth. 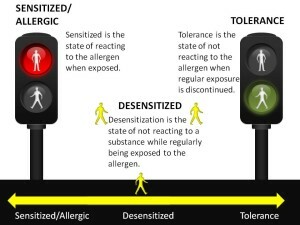 Desensitization is the ability to tolerate an allergen while on immunotherapy. The process involves introducing incrementally increasing amounts of precisely measured food protein through the gastrointestinal tract on a regular basis over an extended period of time. This gradually induces an increase in IgG4 blocking antibody and a decrease in IgE antibody, shifting the balance in the body from hypersensitivity to tolerance. Oral desensitization treats food allergies which are IgE-mediated, but has not been shown to be effective in the treatment of cell-mediated food allergy, celiac disease, or food intolerances. Patients undergoing OIT generally ingest a mixture of protein powder in water or some other vehicle like apple sauce. Treatments are typically started in a medically controlled setting (office, hospital clinic) where gradually increasing doses of allergen are given up to a targeted dose. Following this, most protocols require repeated daily home dosing of this tolerated quantity. The dose increased only in the office under medical supervision weekly, bi-weekly or even monthly. The first part of the process is called “Day 1” of induced desensitization, which may take a few months to a year to achieve desensitization. Desensitization is maintained by regular eating of the allergen, initially daily and perhaps for lifetime. After 3-5 years this daily dosing could move to ingestion a few times a week. Long term, the hope is to induce tolerance to the allergen for some portion of patients: the ability to tolerate an allergen after regular immunotherapy treatment is discontinued. From the literature there is overwhelming evidence that OIT will induce desensitization, meaning that the patient will be able to ingest/be exposed to the food without any reactions. There are over 175 medical journal articles published since 1908 on OIT, as you can see in our Research & Learn Library. Studies have been conducted worldwide, by many different institutions, using many different protocols, methods and different allergenic foods. The results are very consistent in producing desensitization for the majority of participants. There is less evidence on long term tolerance: basically, is this a cure where patients could just stop eating the allergen regularly and not get re-sensitized? Currently, we do not have a test to determine “tolerance.” Studies are still ongoing to determine if therapy will induce long term tolerance, where daily doses will no longer need to be given. We know from a number of studies that after a period of time (studies have varied this length of therapy) that daily dosing can be discontinued and for a month or two the patient remained desensitized without eating the allergen. All of these trials then put the patient back on a daily or a few times a week dosing schedule. The clinical studies done in the last 15 years encompass peanut allergies, milk, egg, tree nuts, wheat, and others. In general, most patients that make it to maintenance are desensitized. Some protocols only went to a level to protect from incidental exposure (i.e. one peanut), more protocols are now moving the patients to a higher level where they do not have to avoid the food any longer. What is the success rate of food desensitization? 2004: We successfully desensitized 15 of 21 (71%) children with severe IgE-mediated CM allergy in a period of 6 months. 2008: After 1 year, 11 (36%) of 30 children in group A had become completely tolerant, 16 (54%) could take limited amounts of milk (5-150 ml) for a total of 90%. 2009: Of 29 subjects who completed the protocol, 27 (93%) ingested 3.9 g peanut protein during food challenge. 2011: During the double-blind, placebo-controlled food challenge, all remaining peanut OIT subjects (n = 16) ingested the maximum cumulative dose of 5000 mg (approximately 20 peanuts). 2014: A total of 352 treated patients received 240,351 doses of peanut, peanut butter, or peanut flour in a multi-practice experience. 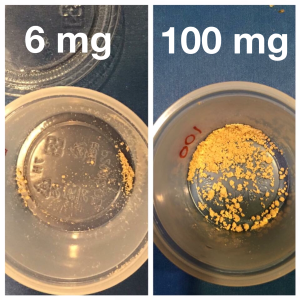 A total of 298 patients achieved the target maintenance dose for a success rate of 85%. 2014: 84% of the active group tolerated daily ingestion of 800 mg protein (equivalent to roughly five peanuts). Peanut starting dose= 0.001mg of peanut protein; One peanut = 250mg of protein; End dose= 8 peanuts. Egg starting dose= 0.0083mg; One egg = 4350mg; End dose one egg. Milk starting dose = 0.1mg; 8oz of milk =8000mg; End dose 8oz of milk. Many patients are able to successfully incorporate the food allergen into their diets following completion of the program. Some patients who do not especially like the taste of the allergenic food choose not to deliberately consume it, but no longer worry about reading labels. In some instances the patient or parent will choose to shorten the therapy and bring the protection only up to protect against accidental exposures. This is sometimes referred to as “bite-proof:” safety from an accidental bite of something containing the allergen, or eating something that was cross-contaminated with the allergen. The patient completing the full OIT protocol does not have to add the food freely back into his/her diet, but the daily maintenance “dose” has to be ingested to maintain the desensitization. At this time, this is considered to be a lifetime protocol, much the same as taking a daily medication or even like daily hygiene routines such as brushing our teeth. 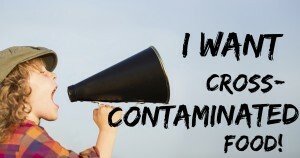 I have been told by allergists that my child’s allergies are too severe to do OIT. Is that true? A) Everyone with real allergy has a severe allergy. There is no mild, moderate, or severe allergy. (This has been recently debated.) Reactions can be mild, moderate, or severe. But, there is no way to predict what kind of reaction one might have or what exposure level will trigger that reaction. Reactions are very unpredictable and variable. One reaction says little about what the next may be like. If you have a real allergy and a risk of anaphylaxis, then it is severe. The numbers show the likelihood of a reaction–they do not tell severity or predict the severity of a reaction. Skin test result of IgE levels are pieces to the puzzle, NOT the whole puzzle. This concept of someone being ‘too severe’ only exists to a non-OIT allergist. Treating life-threatening food allergies is what we do. That is who we are. My child tests positive on blood or skin testing, but has never experienced a reaction. Should we pursue an oral food challenge before attempting OIT/desensitization? Depending on the clinical history and results of skin/laboratory testing, a supervised oral challenge may be recommended prior to pursuing OIT. These challenges are designed to identify patients who can actually tolerate the foods to which they are sensitized. It is not uncommon to discover that patients who were previously advised to avoid peanuts on the basis of a positive skin test (SPT or skin prick test) are actually able to tolerate an entire serving of peanut butter (~10-20 peanuts) without experiencing an adverse reaction. These patients do not require desensitization or treatment for a food allergy. They are free! The private practice OIT doctors do not generally perform food challenges in patients with a clear clinical history of food-associated reaction, unless there is the possibility the patient has outgrown the allergy. This is different than being enrolled in a medically supervised clinical trial where an oral food challenge must be performed to measure a baseline response. After the trial concludes another food challenge is required to measure any change due to treatment. “Misdiagnoses of food allergies can have lasting effects, ranging from anxiety to unnecessary dietary limitations. Over-diagnoses can also trivialize the severity of life-threatening, immune-mediated food allergies which account for about 150 deaths in the U.S. each year. Still, blood and skin tests remain the most frequently used methods of diagnosis. The best approach is to limit food allergy testing to those foods likely to cause an allergic reaction based on the history of problems. Many problems attributed to food allergy by the public and even some physicians don’t have the features of a true allergic reaction at all. Are there any age or other restrictions with OIT? In the past, most OIT doctors started oral immunotherapy at 4-5 years of age, depending on a number of factors. These include: ability to follow directions, ability to refrain from exercise for 2 hours post-dose, ability to articulate symptoms to a responsible adult. As a result of the Leap Study, that general rule is changing to accommodate younger patients. Check with your individual OIT specialist for their guidelines. Desensitization can also be done by older patients. One of the OIT board-certified allergists graduated a 65-year-old retired surgeon with a peanut allergy in 2015. From Dr. Nadeau of Stanford: “For everyone who has stayed in the study, the treatment has been 100 percent successful,” says Nadeau. “It turns out that everyone’s immune system is capable of adapting — and surprisingly, it is as true of adults as children.” She and her team now have an eight-year study of OIT (NOTE: as of 2014) — the longest record in the United States — in which they found that everyone who was compliant with the treatment and continued to eat the foods has kept their allergies from returning. 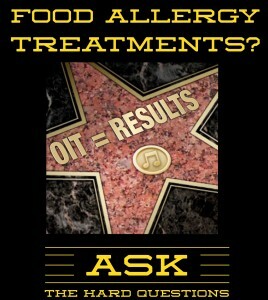 What food allergies can be treated with OIT? OIT theoretically should work for any food allergy as long as the allergy is an IgE-based allergic reaction. The different protocols for all the foods currently being treated are all built off the same basic backbone used for desensitizing pretty much anything (such as food, medications etc.). For peanut, the first dose on a one day desensitization schedule is usually 1/40,000 (Wasserman) to 1/100th of a peanut. How do I know if food desensitization is the right choice for my child? The decision to begin desensitization is based on a variety of factors. These include: risk of reaction to accidental ingestion, difficulty in avoiding the allergen, and a number of quality of life issues (anxiety, ability to participate fully in school, sports and family/social activities, etc.). Another important consideration is the likelihood of spontaneous resolution of the allergy without treatment. For example, if it appears that the child is in the process of outgrowing a milk allergy, observation may be advised for 1-2 years instead of immediate treatment. You do not want a lifelong treatment if the condition is temporary. There are also some patients who are generally advised to avoid attempting oral desensitization. These include patients with active inflammatory diseases of the gastrointestinal tract, such as eosinophilic esophagitis (EoE), cell-mediated food allergy, celiac disease, or food intolerances. What other options for food allergy treatment are available for my child? 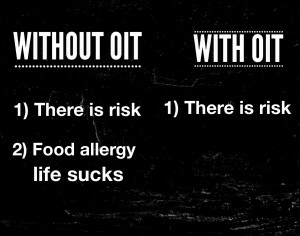 To date, OIT is the only “proven” method of treating food allergies. It is one of the best studied, most effective, inexpensive and most accessible forms of treatment. Other methods under study and clinical trials include Pre-OIT SLIT, SLIT (Sublingual immunotherapy ), EPIT via the Viaskin patch (epicutaneous immunotherapy), and immunotherapy with attenuated food proteins or peptides (rather than the whole food). SLIT or Sublingual immunotherapy works by a similar mechanism as oral immunotherapy. The difference is that the allergen is introduced to the mucosal tissue in the mouth under the tongue as opposed to being ingested. In addition, SLIT uses lower amounts of antigen and results in lower levels of tolerance and takes many years longer, if at all, to reach protection. For example, even when completely undiluted peanut extract is administered sublingually, at maximal doses, you will not exceed the equivalent of 1/125th of a peanut per dose via SLIT. This is why sublingual immunotherapy is not a fast-acting treatment. A few of the OIT allergists use SLIT for some patients as a lead-in to OIT, rather than as a stand-alone treatment. It works well as a means of priming the immune system in highly allergic patients or when parents are too nervous to let their child start OIT. Please only do SLIT or any food-allergy treatment with a board-certified allergist. There are other non-allergist physicians using SLIT and having patients treat for 5+ years with no insurance coverage and the child not being desensitized or protected at the end of treatment. I heard that oral food challenges are mandatory to undergo OIT treatment? The private practice OIT board-certified allergists do not generally perform food challenges in patients with a clear clinical history of food-associated reaction, unless there is the possibility the patient has outgrown the allergy. This is different than being enrolled in a medically supervised clinical trial where an oral food challenge MUST be performed to elicit and measure a baseline response. After the trial concludes there is another oral food challenge to measure any change due to treatment. So if an OIT allergist is performing an oral food challenge, it is with the HOPE that the patient might pass the challenge, avoid treatment and be free to eat the allergen. Contrast that with the opposite situation of an OIT clinical trial where the goal is to cause a measurable reaction to the food for their study. Should we wait for other food allergy treatments to come onto the market? “It’s coming” has been said for 15+ years now. If you need long-term proof, then OIT will have to be your choice since it is the only thing that has been studied for many years. The other food allergy treatments either have no results on humans, or are not very effective, or will be put on the market with “FDA approval” with a small study of a few hundred people for a max of 3 years. No long-term safety or effectiveness data whatsoever. 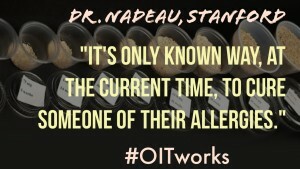 Here is a quote from Dr. Wesley Burks, who pioneered OIT trials from 2007 onward, yet is still waiting to license his OIT protocol to FARE/Aimmune for FDA-approval and mass-market sale of a peanut flour capsule. “Food allergy affects approximately 6–8% of children and 1–2% of adults. For those patients, and the families of patients, who have anaphylactic reactions, food allergy can be devastating. Reactions can range from mild urticarial reactions to severe anaphylactic shock and death from allergenic foods consumed unknowingly. The only preventative measure currently available for food allergy is strict avoidance of the incriminating food, which is often very difficult. Immunotherapy will be available in the near future as a safe and potentially effective therapy for the treatment of food allergy. What are factors to consider when thinking about choosing OIT? 1) Is the risk of OIT less (or equal) than not doing it (risk vs. benefit)? Compare versus the risks of “strict avoidance” and its well-published failures. 2) Is there potential for significant improvement of the quality of life? You do not want the cure to be worse than the disease. Focus on the social, emotional, psychological and physical areas and the current challenges with strict avoidance. Factor in anxiety, time involved with the procedure, the child’s temperament, and even cost should be weighed for treatment vs. status quo. 3) Other health and lifestyle factors must also be considered: family dynamics, religious beliefs, other health conditions such as autism or sensory processing disorder etc. What are the benefits of OIT treatment? 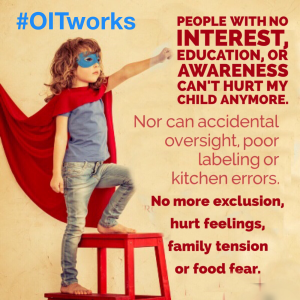 With OIT, there is protection against an accident or mistake caused by the thousands of people—mostly unseen—who will handle a food allergic person’s food during their lifetime. The American College of Allergy, Asthma and Immunology (ACAAI) says nearly 15% of patients per year have accidental reactions. 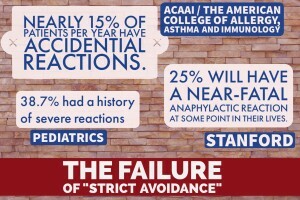 Stanford says approximately 25% will have a near-fatal anaphylactic reaction at some point in their lives. Among children with food allergy, 38.7% had a history of severe reactions according to Pediatrics journal. What risks are associated with OIT treatment? Mild reactions during food desensitization are not uncommon, and tend to be self-limited. Some patients experience mild symptoms the first day of therapy: mild hives, oral itching/burning, or GI discomfort. Transient itching of the mouth and throat occur, and generally resolve within a few minutes without medication. Abdominal pain, gas, reflux, nausea, and vomiting have also occurred. These symptoms are typically managed with the following: dietary modification, antacid medication, and immunotherapy dosing adjustments. The vast majority of patients are able to resolve these symptoms with the above measures, and complete the immunotherapy protocols. Any time that a food allergen is deliberately administered to an allergic individual, the potential for a body-wide allergic reaction (anaphylaxis) exists. Although it is not typical, anaphylaxis has occurred in the context of oral immunotherapy dosing. When systemic reactions are noted, they are immediately treated with epinephrine and additional adjunctive medications as appropriate. Severe reactions are rare occurring anywhere from <1%-10% (of patients) depending on the study and the instructions given to participants as to when to use epinephrine. Most studies the rate of anaphylaxis is 5%. This reaction rate is for the total protocol, not per dose. Systemic reactions do not preclude the patient from moving forward with the protocol. In fact, the majority of patients who have required epinephrine in the course of treatment have gone on to graduate from their respective desensitization programs. Approximately 85% of patients finish the protocol; the 15% drop out rate is primarily due to inability to continue to keep to the schedule, and/or GI discomfort. There have been a few patients (1-2%) diagnosed with Eosinophilic Esophagitis and had to be discontinued (typically unknown if the patients had EoE prior or it was induced by ingesting the allergen). The 15% drop out rate is less in private practice protocols not following a rigid study schedule. This lower dropout rate of “Customized OIT” is due to the ability to slow down the schedule when needed to allow symptoms to dissipate and be minimized. 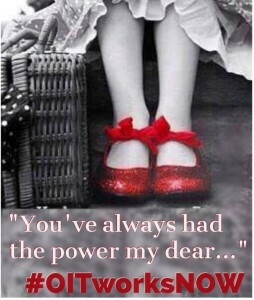 Clinical trials are “Standardized OIT” and therefore have less flexibility when patients need adjustments and support. Like all medical treatments, OIT has serious risks and must be explored thoroughly as a treatment option. It must be compared from all aspects versus the risks and stress of “Strict Avoidance” which also has a failure rate and negative impact on quality of life. With a food allergy you always run a risk of anaphylaxis whichever choice you make. I keep reading about eosinophilic esophagitis (EoE), and it sounds scary. What is EoE? Does food desensitization cause this disease, or can it be a trigger in patients who already have the condition? Eosinophilic esophagitis is an inflammatory condition of the lining of the esophagus (food pipe) which can be worsened by exposure to environmental or ingested allergens. Symptoms include trouble swallowing, and sensation of food getting stuck in the throat, and severe reflux symptoms that do not respond to standard antacid medication. EoE is diagnosed by endoscopy and biopsy which demonstrates an accumulation of eosinophils (allergic white blood cells) in the lining of the esophagus. New research suggests that there is a genetic basis for eosinophilic esophagitis. Therefore, we believe that symptoms of EoE that develop in patients undergoing OIT represent an “unmasking” of the disease process in genetically susceptible individuals who were otherwise asymptomatic due to allergen avoidance. When therapy is discontinued and strict elimination of the allergen re-instituted, EoE symptoms generally resolve within a few months. There are some research centers that have attempted to continue to treat patients with EoE with OIT, by reducing the dose to a very low level and maintaining the low dose for months at a time before attempting increases. This may be an effective strategy, but it is not commonly used yet. If my child needs to discontinue treatment before the protocol is completed, will he/she end up being “more allergic” that he/she was prior to beginning treatment? The allergen-specific IgE initially rises upon exposure to the allergen, so it is possible that a patient who discontinues therapy would have a higher food-specific IgE at the time of discontinuation that they started with at baseline. However, this number will likely fall back to baseline levels with the resumption of allergen avoidance. Additionally, it is important to recognize that although the food-specific IgE does rise at first, the food specific IgG4 (blocking antibody) rises at a faster rate. Therefore, it is unlikely that a patient who needs to stop treatment will be worse off from an allergy standpoint. My aunt/grandmother/neighbor/friend suggests we should give our child “little bits” of the allergens to help them grow out their allergy. Is that what this OIT is? No! OIT must always be done under the care of board-certified allergist who has trained to perform this treatment. No pediatricians, family doctors, ENT’s, chiropractors, licensed acupuncturists, or well-meaning family members should ever give a food-allergic child their allergen. 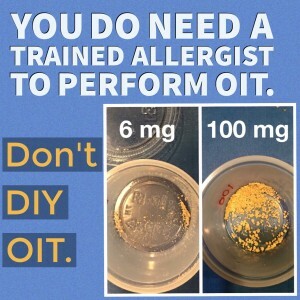 “Do it Yourself” or DIY OIT is playing with the possibility of anaphylaxis or death. Visit the “Certification Matters: Is your doctor board certified?” site to check the credentials and license of your allergist. Is OIT covered by insurance? In a survey of OIT patients, 84% of them had insurance coverage for OIT, up from 46% prior to 2013. 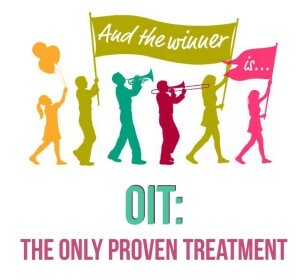 Since OIT is performed 93% at home by the patient (a ratio of 14 home doses to 1 office updose), the majority of OIT treatment is actually done by the patient and family. Oral Immunotherapy is considered experimental but the procedures actually done by the office are covered by many insurance companies. 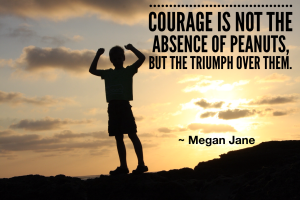 The office visit appointments are for physical checkups, reviewing of status and issues, and counseling/guidance for next steps, sometimes with a food challenge to a previously-documented food allergy. The doctors bill for time and counseling, and many visits are billed as straightforward specialist office visits. 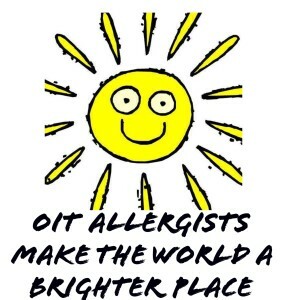 The OIT physicians are regular, practicing board-certified allergists in offices that accept all kinds of insurance plans for the many services they provide. If you have a deductible, co-insurance, or co-pay, these will apply the same as it would for any doctor visit. Insurance companies dictate the end cost. Depending on where you live, payments to the office of patient plus insurance can range from $150-250/hour for the first day, and $150-300 for each updose (typically 16-26 appointments). Your deductible and co-pay will also determine what you pay out-of-pocket. For non-insured patients or patients wishing to bypass insurance, projected costs and cash discounts can be discussed at the consult appointment. Do I need to call my insurer to verify coverage? What should I ask? The most important thing to verify is the allergist office is a participating provider in your plan. The best way to do this is by calling your insurer or checking their website to verify in-network status. Most people on the end of the phone line at your insurance company will not have the slightest idea what OIT is, so it will not be especially helpful to ask. Instead, you can confirm coverage for specialist allergy/immunology care (in general), determine if you have a specialist co-pay or coinsurance, and find out how large your deductible is. The billing department at the allergist office will be able to help you with questions, the same as for any other medical visit or treatment. How do I prepare for the initial consultation? 1) Learn about OIT: Spend time learning about how OIT works. Visit our Research & Learn Library to see news media and read journal articles. Read the testimonials. Consider joining the Facebook patient support groups. OIT is very complex and if you have a rough understanding of it and list your questions and concerns you will get more out of your initial consult. 2) Schedule a consult appointment by calling the office you want to visit on our “Find a Doctor” page. Some offices offer phone consults if you are going to be traveling. The offices understand that you may be very eager to begin therapy. Please do not worry if there is a wait for a consult. Because food desensitization is not widely available, consultations are occasionally booked out by a few weeks or even months. The doctors deliberately do not “squeeze in” appointments, as this reduces the quality of care. Rest assured that your family will receive full attention and focus at the time of your appointment, and you will work together to create a comprehensive food allergy risk management plan. They appreciate your patience. My child is allergic to multiple foods. Do you perform desensitization for multiple food allergies at once? Traditionally allergists performed food allergen desensitization one food at a time., however many practices allow combinations of foods, like milk and egg together or up to 4 different nuts together. This is known as mOIT or multi-allergen OIT. 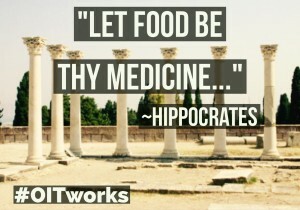 Most patients generally elect to start with the food that is most impactful to safety and/or quality of life. Once a patient has been on their maintenance dose of one food allergen for 1-3 months, desensitization for a second food can begin. My child is very nervous about the prospect of ingesting his/her food allergen. How can we ease the anxiety associated with the desensitization process? Parents need to understand the science behind it and how OIT works. Luckily there are hundreds of articles and clinical studies to read, and videos to watch in our Research & Learn Center. It’s actually overwhelming how much is available. One of the best ways to ease the anxiety associated with this process is to connect with other families who have already completed or are in the process of desensitization. We have many wonderful families in our Facebook support groups who will share with prospective patients about food desensitization. It will not be difficult to find a peer that your child can connect with as well. For older kids and teens, along with the above, it has to be their choice. They MUST buy in. It’s their life and their body. But understand their valid fear and total ignorance of how OIT works. What has worked well for parents is to assure them “if and when” they do OIT is their choice. However, they must go through a formal process to explore OIT and learn about it first. This is a life skill you can give your children about how to manage their health and make tough decisions. Require them to learn the science behind OIT. How it works. Thresholds of tolerance. Read the articles and studies. Watch the other kids’ videos and postings. Then develop a list of questions, fears and concerns and go for a consult with an OIT doctor where they can ask their questions. The best source of information you will ever find, is an actual doctor who specializes in the treatment you are considering. Then, after they complete this process, your older child can make an INFORMED DECISION if they want to do OIT or not, and when. It’s parenting and empowering at its finest. What can we do to increase the chances of successful desensitization? The most important thing to do when preparing the body for desensitization is to focus on obtaining excellent control of gut inflammation, eczema, allergic rhinitis, and asthma. This may require a combination of dietary modification, environmental control, medication, probiotics, skin care, and/or aeroallergen immunotherapy/allergy shots. 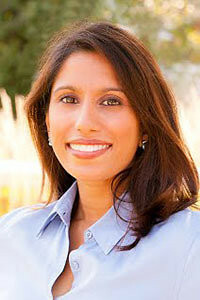 Ask your allergist for a plan to “calm the system” at the end of the first consultation visit. The amount of work necessary to get other allergic conditions under control will have an impact on the timeline for beginning food desensitization. During the desensitization process, consistency and routine are key. Attempt to administer all doses within the prescribed time periods, as irregular dosing is associated with a higher risk of reaction. Be sure to offer a healthy diet with plenty of complex carbohydrates to aid in the buffering and steady absorption of the allergen dose. Never dose on an empty stomach. Offer plenty of healthy snacks throughout the day. Drink plenty of water, and avoid dehydration. Call or text the doctor immediately to get instructions for dosing during GI illnesses or fevers. Have a responsible adult available and ready for the 1 hour observation period after dosing. Strictly observe any recommended exercise restrictions (usually 2 hours for OIT) after dosing. Preparation and Planning: We live out of town. Is an appointment really necessary or can we begin directly with desensitization? A one-on-one consultation is critical to receiving the highly personalized care that your child deserves. In person is always best, especially if a child is in any way nervous about OIT. In order to offer your child the most appropriate treatment, the doctor must be able to fully understand the clinical history and assess current levels of allergic inflammation in the gut, skin, lungs and sinuses. This is not possible without an in-person evaluation and physical exam as you start treatment. Initial phone consultations are sometimes offered for patients who must travel out of state to begin the process of working together. Ask your office what their process is. My child has already had testing performed to confirm the allergy. Will repeat testing be required? Possibly. It is important to have accurate baseline laboratory values within a few months of beginning desensitization. In addition, some offices utilize component testing for a variety of food allergens. This type of testing breaks the food allergy down into the individual protein within the foods that a patient might be sensitized to. These tests are only now becoming more common, and many patients have never had them performed. Some offices also track food-specific IgG4 for certain foods. Call and ask the office what they prefer you do. Many offices recommend that you do not have blood drawn immediately prior to your consultation, as it is likely that additional evaluation will be needed. Doctors wish to minimize the number of blood draws their patients require! What is the timeline for food desensitization? Rapid desensitization or “DAY 1″occurs on a single day, and takes ~4-8 hours from start to finish depending on the doctor and the office. OIT takes ~5-12 months of daily dosing with weekly or bi-weekly updoses. Typically there are 14 home doses in between appointments. 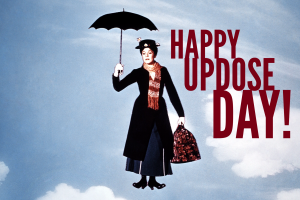 If dosing is done twice daily, then updosing can be done once a week. Once a day dosing will take 2 weeks to complete the 14 home doses before an updose. These are the minimum times allowed; you can go slower. Some patients may be advised to pursue a slower schedule of once daily dosing with updoses every 3-4 weeks. The advantage of private practice and “Customized OIT” is that the schedule can be completely flexible to meet the needs of the patient and the family. This includes taking vacations or reducing financial stress and travel with longer gaps between appointments. What do we bring to the Day1/ rapid desensitization appointment? On the Day 1/rapid desensitization/ rush immunotherapy day, incrementally increasing doses of allergen will be administered every 20-30 minutes over 4-8 hours. You will be checked in, vitals taken (blood pressure, pulse, weight, pulse ox, and if asthmatic then peak flow), and a physical exam performed. The starting dose will be given. This is the allergen protein diluted in distilled water and usually flavored with Kool-Aid or grape juice, or peanut flour mixed in applesauce. Every 20-30 minutes vitals are retaken and the next dose given. The initial doses are microscopic in size, and are hundreds or thousands of times smaller than what a typical allergic patient can ingest without a reaction. This is how OIT works and thousands of patients have gone before you and proven that it works. At the first sign of any side effect or reaction (mouth itching, GI discomfort, hives) the day is stopped. Patients are monitored for at least one hour after the last dose. Many patients make it up to the last planned dose of the day (which varies from food to food). There are portions of patients who do not make it to the final dose: that is not “failure”. The protocols are designed from research that show many can safely make it that far. Stopping earlier is just proof that their bodies need “Customized OIT” to match where their “threshold of tolerance” really is. Whatever dose the patient has tolerated last without any symptoms will be what they go home and take every day, once or twice a day depending on the protocol. In general most of the protocols have 16-26 increases after the first day to reach the full maintenance dose. If you are only going to a “bite-proof” level it will be fewer visits. No increases/elevations are to be undertaken at home, for any reason! How do we know the first dose can be tolerated? I was told “trace amounts” could cause a reaction! People often ask how we “know” the starting OIT doses will be tolerated. The answer is that they have tested this many times to learn the “threshold of tolerance”. What is threshold? Per the Oxford dictionary: “A limit below which a stimulus causes no reaction”. In other words, the key to understanding OIT is that there is low level of allergen your child can safely eat without a reaction. It’s invisible to the body. Then it’s raised slightly and the body still doesn’t react. The “threshold of tolerance” is gradually increased over time. 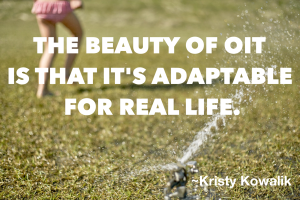 The immune and digestive systems adapt, as they are meant to do. The threshold is different for everyone, and for every different allergen. The allergen is a protein and it has to be introduced into the body to elicit a reaction. It can get in through ingestion, skin contact, inhalation or contact to mucus membranes. Threshold is also a moving target. Threshold is never static as there may be many factors that could lower your threshold: fever, exercise, hormones, viral illness, and other allergies such as seasonal ones. 2 (5%) tolerated 1.5 mg.
How long should we expect to be in the office during “updose” visits? OIT increase visits take ~10-15 minutes for intake, with a 1-3 hour observation period. Most offices say to schedule a minimum of 90 minutes. After a dose increase at the office, what is the procedure at home? 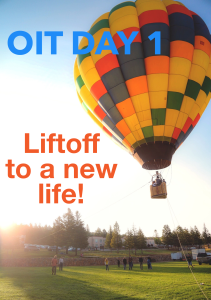 OIT is administered either once daily (every 22-26 hours), or twice daily (every 10-15 hours) at the dose tolerated during the prior visit. Never dose on an empty stomach. Be sure to offer plenty of complex carbohydrates to aid in the buffering and steady absorption of the allergen dose. Many patients “sandwich” the dose in-between carbohydrates and take the dose in applesauce which provides polyphenols. Polyphenolic foods like apples are known to help with allergic responses. Consuming dairy products with dosing has been known to aggravate some stomachs. What is the procedure for reactions that occur in the office setting? Mild reactions such as oral itching or just a few hives around the mouth are treated with drinking liquids, washing the area with water, and observation. If symptoms do not resolve spontaneously within 20 minutes, Benadryl may be administered. Moderate reactions (abdominal pain, nausea, vomiting) are treated with liquids, food (complex carbohydrates and applesauce), and medication if needed. 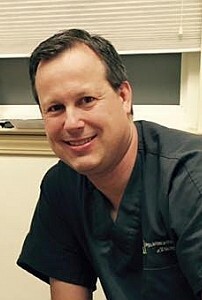 Systemic reactions (multiple organ systems) are treated with intramuscular epinephrine, Benadryl and/or steroids at the discretion of the physician. Systemic reactions that occur in the office setting are monitored in-house until the patient has been symptom-free for at least 1 hour. If needed, transport to an emergency facility will be arranged. Most offices are within close distance to local hospitals. Following any reaction, dosing adjustments will be made at the physician’s discretion. What is the procedure for reactions that occur at home? Observe a similar procedure as in-office reactions. Your allergist will give you specific instructions and different scenarios but they should be notified by text message or cell phone at the onset of any symptoms. The doctor will then advise as to the most appropriate treatment course. Some doctors provide a medical kit with several different medications and instructions on usage. For severe reactions, do not hesitate: administer epinephrine, call 911 and then the doctor. Is there flexibility in the dosing schedule if conflicts arise (exams, sports, vacation, etc)? Of course! Pursuing food desensitization doesn’t mean that the rest of your life gets put on hold. You work OIT into your life, not work your life around OIT. Skipping an increase here or there, or staying on one dose longer that 1-2 weeks is never a problem. As long as regular home dosing continues uninterrupted, there will be minimal impact. “Low and slow” is often best for bodies to naturally desensitize anyway. Most people with mild/moderate symptoms will show improvement over time and may need longer in-between some doses. There may be adjustments made along the way when needed to slow the progression. This delay will not harm progress; it just slows it down a bit. How do we handle illness during OIT? Different doctors have different instructions. In general, dosing should be avoided or reduced during fevers >100F, during gastrointestinal illness, and during the first 24 hours of taking a systemic antibiotic. In general, if only 1-2 doses are missed, home dosing can be resumed with the doctor’s guidance. If there are more doses that need to be missed, the doctor will work with you to develop a step-up plan to get back to dosing, or have you come in and increase the dose under supervision in the office. If an increase was scheduled and the patient gets sick, it is often better to reschedule the appointment than to try and stress the immune system when it is already working hard. We are not ready to begin yet, but would like to establish care so that OIT/desensitization can begin as soon as possible once the time is right. Is this permitted? Certainly. Most of the board-certified allergist’s practices are not limited to OIT/desensitization alone. They are happy to care for your family in any capacity necessary. Hope you found this page informative! Where to go next on our site? Research & Learn Library: over 400 news stories, media coverage and medical journal articles. Special thanks to Dr. Sakina Bajowala and Dr. Chad Mayer, whose excellent websites provided the core foundation and content for this Q&A section.